- The 7th Annual Conference of Economic Forum of Entrepreneurship & International Business was held in Hughes Hall, Cambridge University, Cambridge, United Kingdom on June 28th & 29th, 2018. - The 6th Annual Conference of Economic Forum of Entrepreneurship & International Business was held in LMH, Oxford University, Oxford, United Kingdom on January 28th & 29th, 2017. - The 5th Annual Conference of Economic Forum of Entrepreneurship & International Business was held in the Joseph B. Martin Centre, Harvard University, Harvard, USA on January 29th & 30th, 2015. - The 4th Annual Conference of Economic Forum of Entrepreneurship & International Business was held in London University Institute in Paris, France on January 31st, 2014. 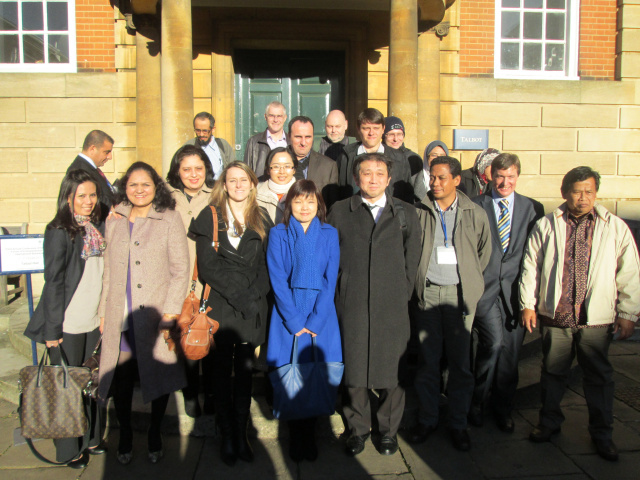 - The 3rd Annual Conference of Economic Forum of Entrepreneurship & International Business was held in LMH, Oxford University, Oxford, UK on February 1st, 2nd & 3rd, 2013. - The 2nd Annual Conference of Economic Forum of Entrepreneurship & International Business was held in University of Ottawa, Ottawa, Canada February 2nd, 3rd & 4th, 2012. - The 1st Annual Conference of Economic Forum of Entrepreneurship & International Business was held in Cairo, Egypt on April 14th, 15th, 16th & 17th, 2001. - The Scientific Conference of Microfinance and Sustainable Development was held in the University of Ottawa, Ottawa, Ontario, Canada on June 20th, 2017. - The Fourth Annual Conference of Agricultural Economics and Agribusiness was held in Hughes Hall, Cambridge University, Cambridge, United Kingdom on February 2nd, 2018. - The Third Annual Conference of Agricultural Economics and Agribusiness was held in LMH, Oxford University, Oxford, United Kingdom on January 29th, 2017. - The Second Annual Conference of Agricultural Economics and Agribusiness was held in Harvard University, USA: The Joseph B. Martin Centre on January 30th, 2015. - The First Annual Conference of Agricultural Economics and Agribusiness was held in London University, London, United Kingdom on April 30th, 2014. Note that; the annual conference of agricultural economics and agribusiness joins the annual conference of economic forum of entrepreneurship and international business every year since 2015. - The CFCE Second Annual Conference of Cultural Economics: Immigration Matters & Human Resources Management was held in Harvard University: Harvard Medical School: The Joseph B. Martin Centre, United States of America on January 29th, 2015. "This conference joined our 5th Annual Conference of Economic Forum of Entrepreneurship & International Business in Harvard". - The CFCE Annual Conference of Cultural Economics: Immigration Matters & Human Resources Management was held in LMH, Oxford University on June 5th, 2014. "This conference joined our 3rd Annual Conference of Economic Forum of Entrepreneurship & International Business in Oxford". - The 4th Annual Conference of Islamic Economics & Islamic Finance was held in Chestnut Conference Centre, Toronto University, Toronto, Canada on November 1st, 2018. - The 3rd Annual Conference of Islamic Economics & Islamic Finance was held in Chestnut Conference Centre, Toronto University, Toronto, Canada on October 29th, 2016. - The 2nd Annual Conference of Islamic Economics & Islamic Finance was held in Chestnut Conference Centre, Toronto University, Toronto, Canada in October 30th, 2014. - The 1st Annual Conference of Islamic Economics & Islamic Finance was held in Chestnut Conference Centre, Toronto University, Toronto, Canada on August 30th & 31st, 2013. - The Annual Intellectual Symposium of Islamic Financial Economics in London, UK on May 28th, 2014. - The Intellectual Symposium of Islamic Financial Economics in Oxford, UK on January 30th, 2017. - ECO-ENA, Inc., Canada 's Open Statistical Analysis Day in the University of Ottawa, on May 4th, 2013. - ECO-ENA, Inc., Canada's Open Financial Analysis Day in Triumph hotel, Cairo, Egypt on April 17th, 2001. We aim to collect original scientific material in Economics & all its multidisciplinary domains from scholars and freelance researchers from all around the world and to discuss them in intellectual symposiums every year. All accepted research works are electronically deposited in the conference proceeding with an ISSN and ISBN at Library & Archive Canada after discussion at the conference and modification if needed to preserve the collected material for generations ahead. The conference e-proceeding can be internationally and freely accessed for anyone to view. We as well add new concepts and new scientific techniques to the existing literature as a valuable output to our annual conference for researchers to benefit and to intellectually accumulate to. Please note that getting a visa for international delegates is only the responsibility of the international delegate. ECO-ENA, Inc., Canada provides only acceptance letters upon finalizing registration and conference (non-refundable) fees payment by the delegate. If you are a participant to the conference please don’t proceed for payment unless you receive an acceptance email from the conference chair because all fees are non-refundable according to our financial policy. Please note that ECO-ENA, Inc. International Conferences are small scientific conferences. We aim to compile intellectual material for discussions and publications. Please note that according to our new attendance policy after January 15th, 2014 we accept registrations of attendees from the host country of the conference only (Or from countries that don't require that complicated traveling documents to attend the conference) while we accept participation with original intellectual work from anywhere in the world. In order for the accepted paper/ article to be included in the conference final proceeding at least one author is expected to attend the conference and to present his/ her paper after finalizing registration. All comments by discussants should be considered for the final publication at the conference e-proceeding. Best 3- papers of any of our international conferences would be considered for publication at our scientific peer reviewed journals after they go for another peer revision. 1. The manuscript must be original. 2. The manuscript must completely avoid all types of plagiarism according to the APA regulations. 3. All references must be written according to the APA citations. 4. The manuscript must follow all scientific regulations of a scientific research paper according to the APA style. 1. Only abstracts submissions would be considered for Panel Discussion Sessions. 2. The abstract must follow the APA style of writing an abstract of a research paper/ an article. 3. The topic and the title must be relevant to the conference themes. - Only the chairs of the conference accept/ decline submissions according to the criteria of selections mentioned above. - After finalizing registration and paying the required conference fee; accepted submissions would be included in the final program of the conference. - This conference is about intellectual meetings that include scholars in the same/ in relevant field (s), freelance researchers and practitioners. The participant must present before a few of those scholars/ researchers. Comments would be received during the conference would help in improving the submitted work. All accepted manuscripts would be equally considered for publication in the conference e-proceeding. The best three manuscripts would be considered for publication at ECO-ENA's peer reviewed journals after they go for another peer review process. - A complete report after the end of the conference would be posted on the conference website with complete transparency. - Because our fees are not refundable so payment would be only accepted by the conference organizer after acceptance of submitted papers/ articles/ abstracts. - This is an international conference so international scholars/ researchers/ practitioners are welcomed to apply from anywhere in the world. - Our work as the organizer of this conference is completely transparent and available to all applicants to view. - After finalizing registration; the organizer sends both the acceptance letter and the receipt of payment with complete information signed by the president of ECO-ENA, Inc., Canada to the conference delegate within three business days from the time of payment. - The organizer of the conference abides by the ethical codes of contacts. We depend on sending/ receiving messages and attaching files by emails as a record of all our contacts with all delegates.